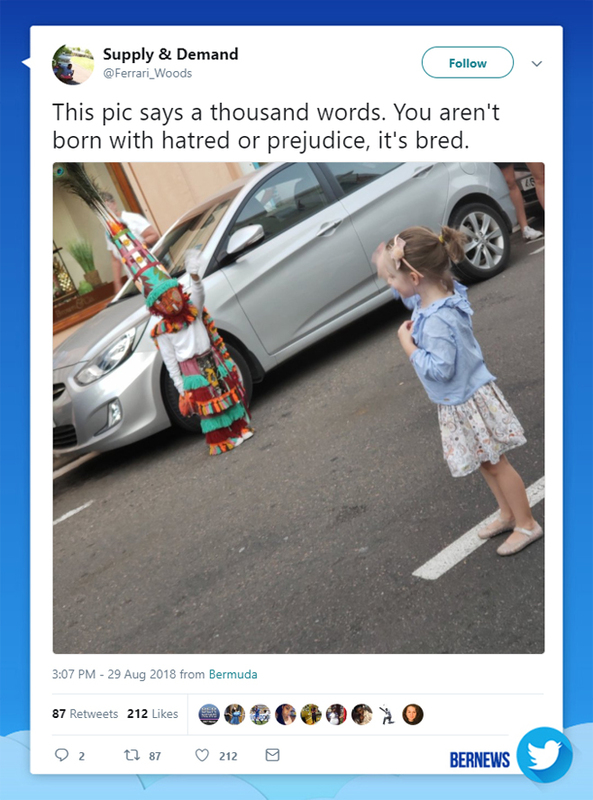 A photo highlighting a uniquely Bermudian depiction of the old adage a ‘photo says a thousand words’ has gone viral, with the image, posted by Twitter user ‘Supply and Demand’, showing a little girl and a small Gombey waving at each other. Please share morw stories of Unity in Bermuda. Same goes for Religion: Children are not born with religious hate and intolerance. That has to be taught. Shame! Pure religion teachers kindness and love toward others, even to enemies. Even non-religious people teach hate and intolerance, just look up the “human zoos”. The problem is inside of the human heart, the answer is in Pure Religion. Oh please…get educated..it’ll cure your ‘pure religion’ AKA, pure hatred. we all are brainwashed from birth by our parents. In later Adult life many are brainwashed further by corrupt political snakes. It takes a lot of courage to stand by your own morals and integrity against the masses and yet, children do it naturally. The minute I gave up religion I became the person I always wanted to be, non judgemental and kind to all (at least that is what I strive to be). Ironically, that is what Jesus taught yet the religious crowd just don’t get it. Most people believe they are right in their own eyes. Day…your bible is BS..if you are a good xtian, like you claim to be…then keep it to yourself. Your religion is personal, no one else needs to know. Why would such a neat photo have such a stupid caption ? I pose that the poster wanted to start something . In my experience ‘prejudice’ in most cases isn’t taught , but it is learned . If anyone out there is smart enough to understand that. Agreed. Few directly teach hatred and prejudice. We absorb it from our environment. Learning it without even being aware of it. Teaching it and not being aware that we’re teaching it. Modeling it with out knowing we’re modeling it. It’s so blatant and yet so subtle. Mind you, I don’t have a problem with the captioned photo. Love it! I agree, how would a child so young know the colour of the child in the gombey costume. To her it’s just a child gombey that she would like to say ‘hello’ to. Bernews, and youtube where every single conversation has to be a race or religion bash. Some of you all need someone to love you. Its part of our Global and Local History and present lives. Hatred and pegudice is part of our global and local history, so we should just get over it? What, and just and go with it? That has to be one of the most ignorant things I’ve ever read! No wonder Bermuda is so racially divided. It’s just stuffed full of ignorance, stupidity and entitlement. All you need is to have your home broken into several times . The B.P.S. soft on crime lets them go. Then you will have a whole new out look on life. I f you can get away with not paying $5,000,000. hotel tax you can also get away with #$55,000,000. that money is not in Bermuda or may be it went to renovations and landscaping. OBA was a polarizing political party too. They favored the privileged few. So where you get off talking trash about the PLP? You need Jesus!